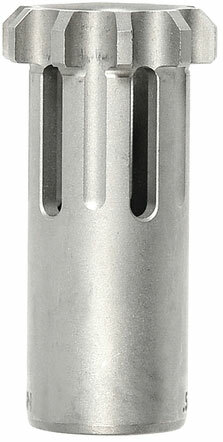 Single Ti-RANT 45 series silencer can be used on a variety of host firearms with different barrel threads by quickly and easily swapping out the threaded A.S.A.P. piston in the rear of the silencer. A.S.A.P. pistons are manufactured to match the barrel threads of all popular factory threaded pistol barrels and many aftermarket barrels. All Ti-RANT series pistons feature heat treated stainless steel construction, a matte bead blasted finish, and engraving to identify the thread diameter, pitch, and direction of rotation for installation (Right or Left Hand threads)..